This category of work considers the banknote as exemplary monetary object and is divided between the ubiquitous-but-worthless inflationary currency of the Weimar government in Germany (1923-24) and the ubiquitous-and-authoritative designs of the American Federal Reserve and private banking periods. Prototype (2006) Etched copper, wood. Series of 7 pieces, each 18 x 10 x 2 cm. 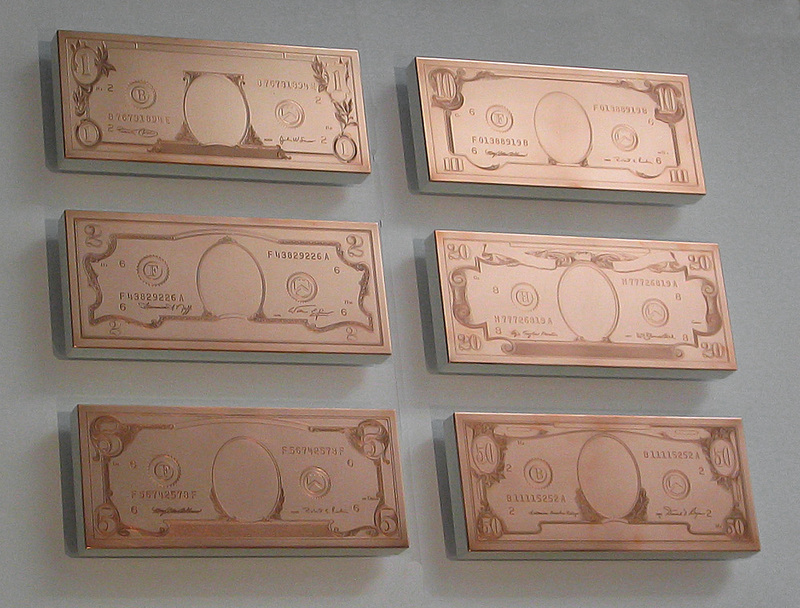 A series of polished, copper plates etched with the designs of the U.S. Federal Reserve paper currency. The designs have been altered so as to remove national identifiers such as presidential portraits and national titles. 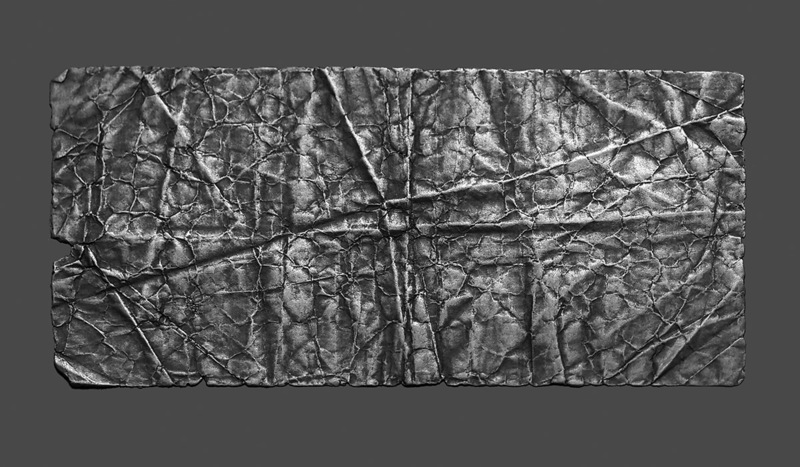 The copper is a reference to printing plates and, in the sense that is a reduced and idealised reconstruction, the etched plate is also a 'prototype' for the inked impression on paper. Copper blemishes easily and oxidises over time, so in order to maintain their clarity the plates must be polished regularly - an action which over time will wear down and eventually erase the surface impression. 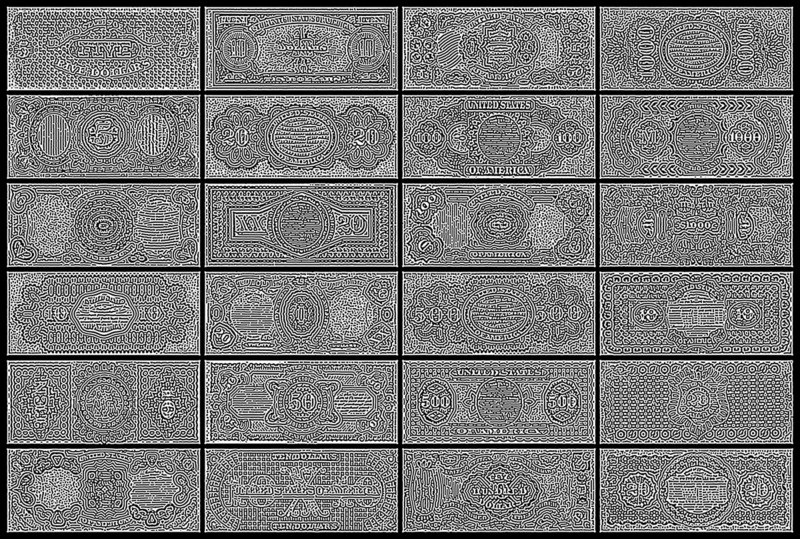 These forms derive from the reverse sides of the earliest issues of U.S. National banknotes, produced either by the American Banknote Company or by the (newly formed) Bureau of Engraving and Printing. 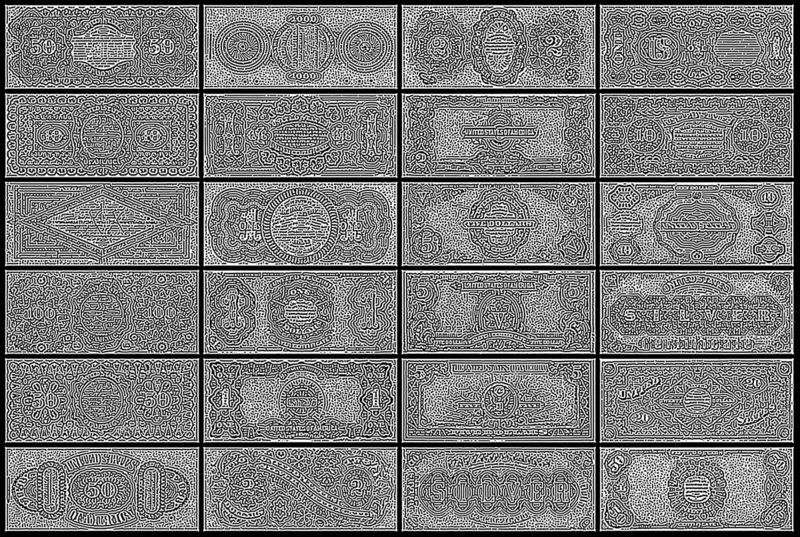 Much of the decorative intensity of these designs is inherited from the earlier era of unregulated banking when one of the most important roles of banknote design was to ‘advertise’ the security and probity of the issuing bank. The process of reticulation is based on a reaction/diffusion process (applied as a series of pixel filtrations) that causes the image to break down in a way similar to that of an image reproduced repeatedly on a photocopier. The process simplifies its graphic tonality and also ‘etches’ into prominence the latent hierarchy of the design. 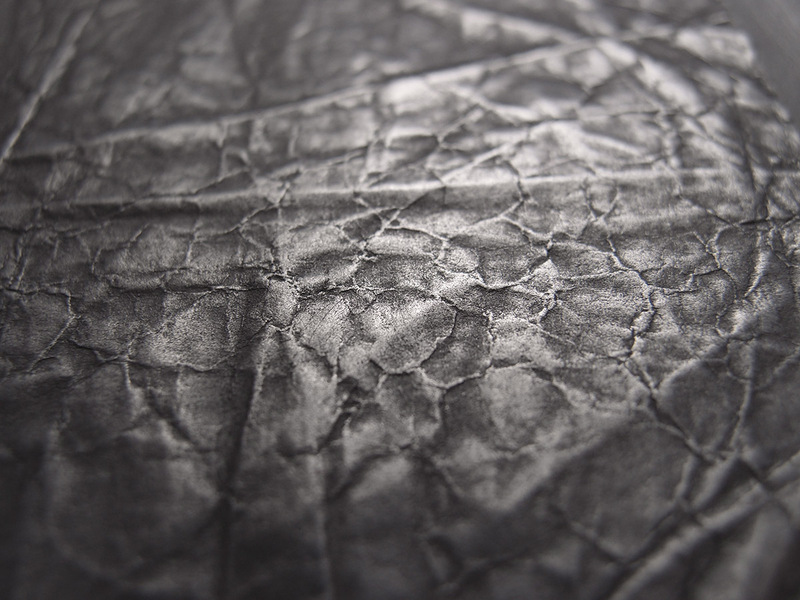 Inkjet print on archival paper. Series of 5 pieces. Each 20 x 27 cm. The only banknotes I collect are from the period of inflation in Weimar Germany when the production of money increased in volume and diminished in value. Some issues were over-stamped with raised values and some were expediently printed on just one side. 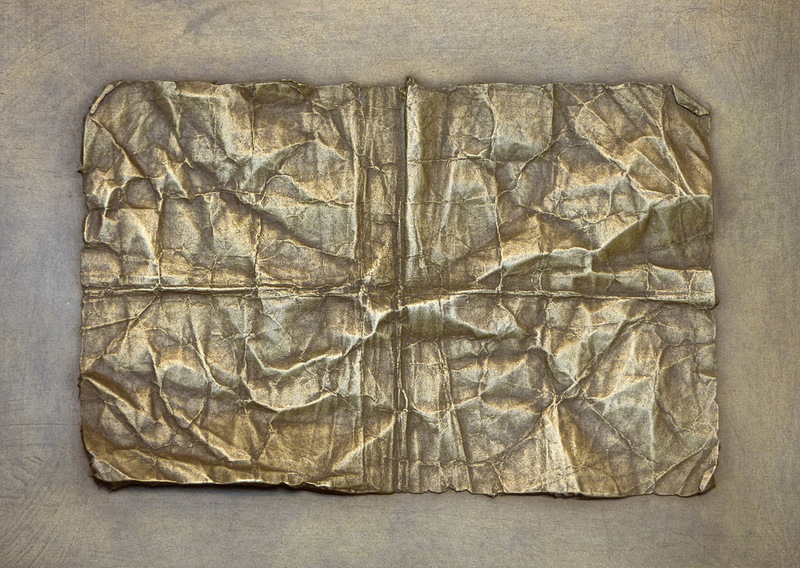 These works attempt to isolate and highlight just the impressions of the banknote's transit through the social body. 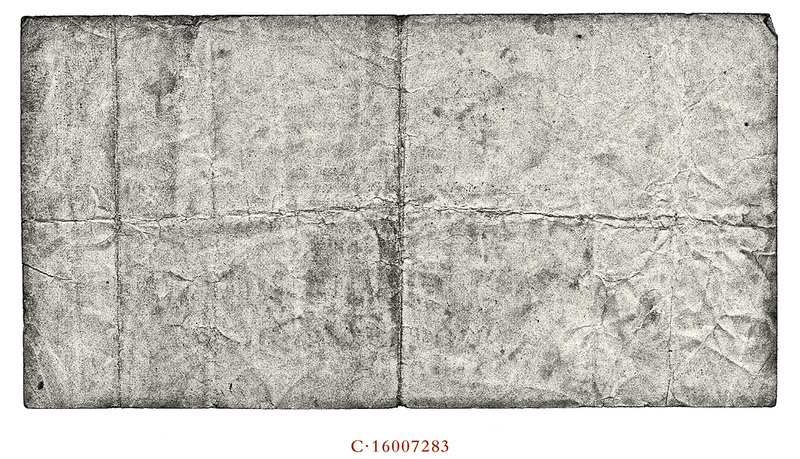 Without the interference of printed design, the blank reverse of the note collects the creases, stains etc. 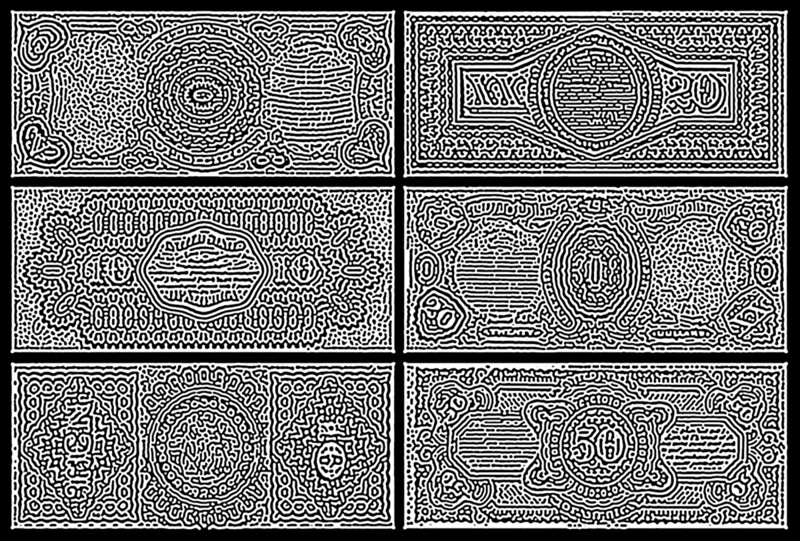 These are the "printed" impressions of money's agitated velocity (Geldumlaufgeschwindigkeit) caused by the calamitous conditions of hyperinflation. 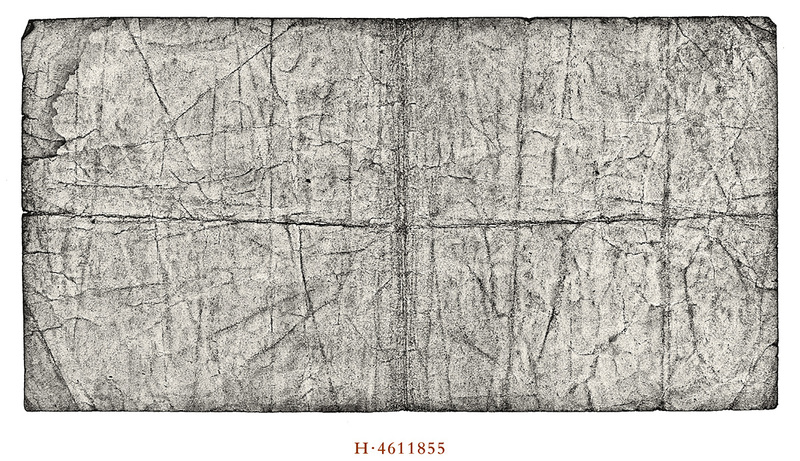 Occasionally the blank back of the note was used as notepaper: some bear the scribbled calculations of the enormous quantities used in everyday transactions. 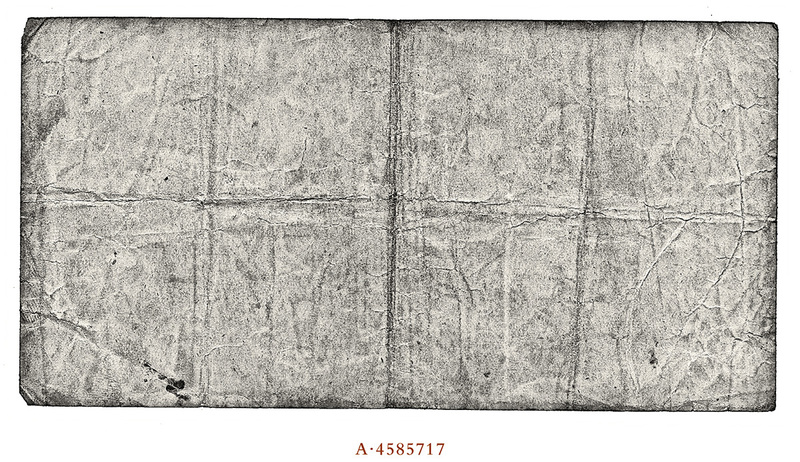 These notes are relatively low denominations (500 Marks) issued in the early period of hyperinflation. 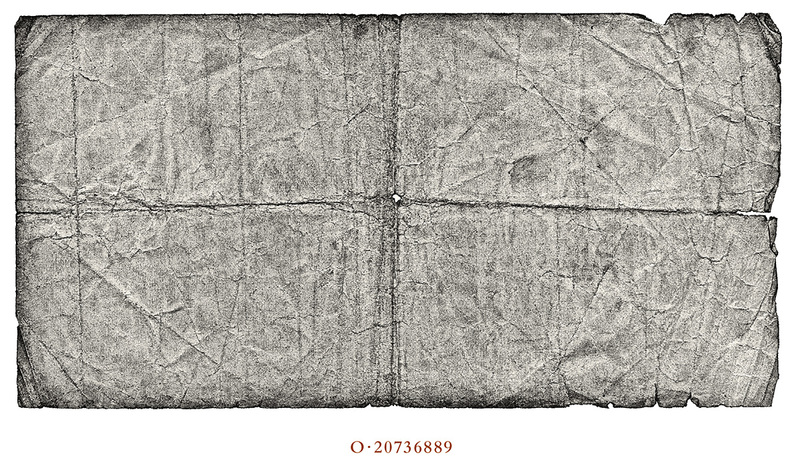 In the later period money was required to be exchanged in such quantities that individual notes were barely handled at all. 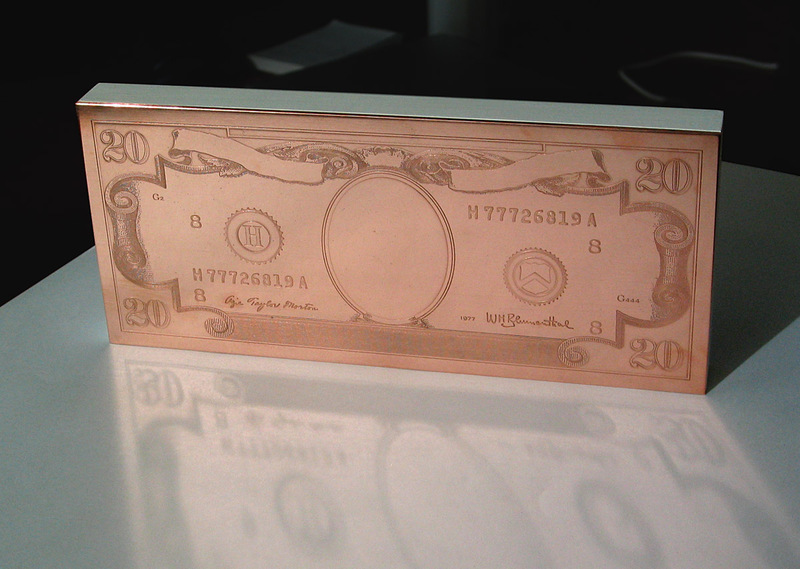 I refined a method of making silicone moulds of the banknotes from which I could take casts in a range of materials. I worked on this chiefly as a means of eliminating ‘content’ from those notes that were printed on both sides of the paper. 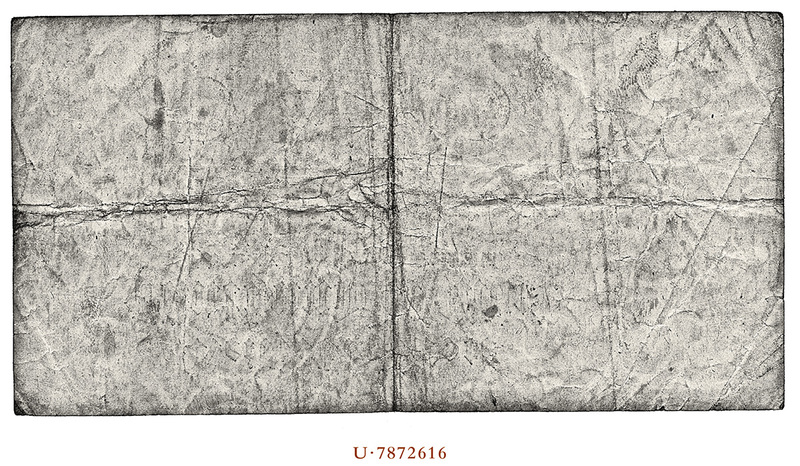 Whereas the tonal series isolated marks that had accumulated on the reverse of the note and represented an analogous impression of the money’s circulation in the marketplace, the ‘Stereotype’ series excavates the traces of the banknotes being folded or crumpled to be carried or concealed. 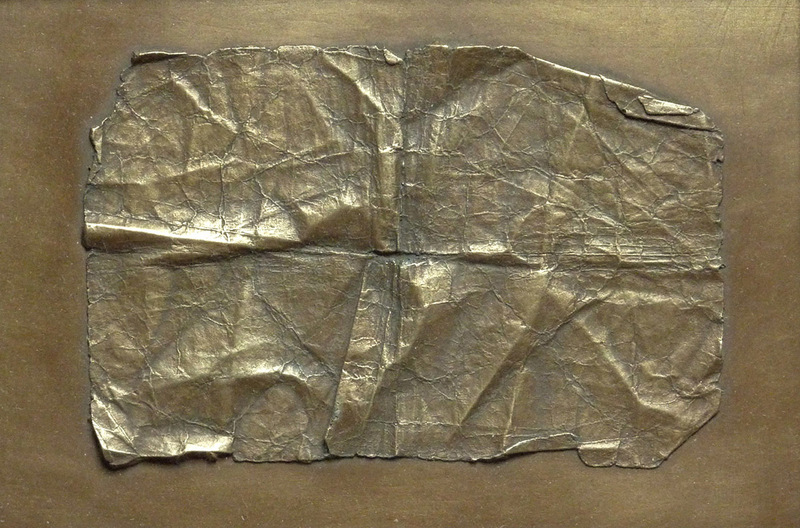 Casting the surface in ‘metal’ implies a reversal of the historical trajectory of (paper) money from specie towards print (on paper or polymer). 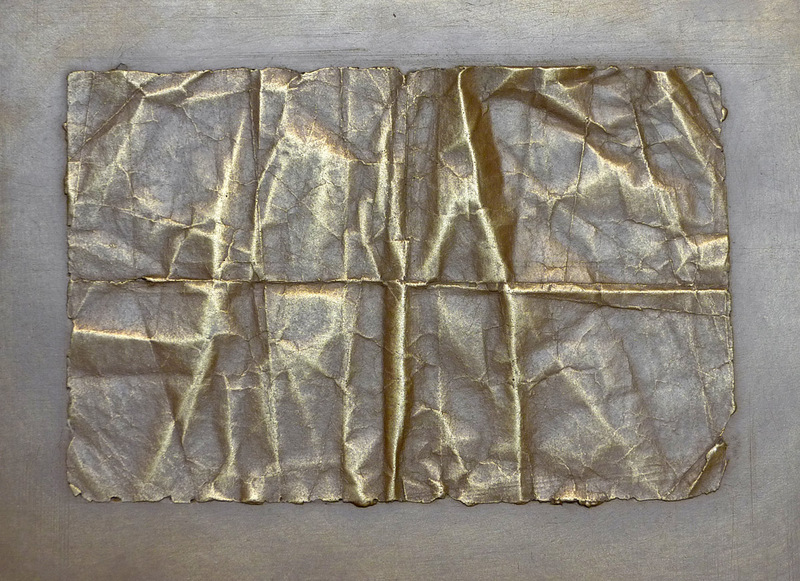 In this series the print has returned to a metallic material as a reproducible stereotyped object. In the process it has been possible to erase from the banknote the impressions of both hand and printing press.